Lillehammer Olympiapark AS is not for its own financial purpose and owns and operates the Olympic facilities in Lillehammer. We are responsible for re-use, maintenance and development of four facilities: Håkons Hall, Lysgårdsbakkene Ski Jumping Arena, Birkebeineren Ski Stadium and Lillehammer Olympic Bob and Luge Track. Our facilities are very important for everyday life in the local community, where all athletes and tourists to sports teams and athletes are active users. Due to our unique capacity and infrastructure, we attract both tourists, national and international events and major training sessions. The company's main task is to facilitate the greatest possible activity, not only in the facilities, but also in the local community. Our many events create priceless ripples among the nearby tourism companies. The logo was developed to the 1994 Olympics, and consists of a stylized aurora borealis (northern lights), the five olympic rings, the snow crystals and the title "Lillehammer '94". It was inspired by the interaction with nature, the sky and the snow. Aurora borealis is a natural phenomenon due to the northern position of Norway. It has associations of power, great excitement and dramatic acting. The main colors of the emblem are cobalt blue and white. 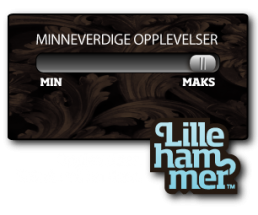 We at Lillehammer Olympiapark continued the logo and developed it to suit our purpose. 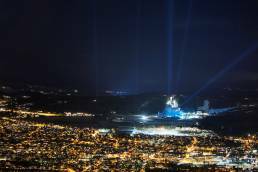 The Olympic Arenas in Lillehammer form an example of how tourism, sports and business unite for common pleasure, development and profitability.